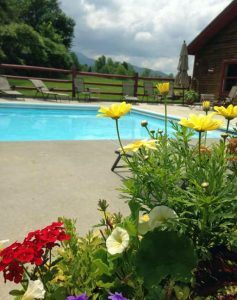 Looking for a Vermont resort with pool? Pool? Yes! At long last… it’s summer at Sterling Ridge Log Cabins in Vermont! There were times during this last winter when we doubted we’d ever see those lazy of summer again, too—but the sun is out, and we are, too! There is something so wonderfully carefree about the warmer weather; something so rejuvenating about leaving the house (or, even better, the log cabin!) without boots and hats and layers upon layers of clothing; something beautifully childlike about the joy that summer brings. The snows of winter helped to feed the Lamoille River this spring. Canoe or kayak down the Lamoille at your leisure-take in the sights; pause for an old fashioned picnic along its banks, or plunge into the cool waters. Vermont Canoe and Kayak offers many options, and we have paddleboards, too! Check out the Sterling Ridge Resort and Log Cabins Stay and Paddle package. It’s like having your cake and eating it, too! Nothing appeals to the kid in us as much as a swimming pool on a hot summer day. A Vermont resort with a pool? Yes! We’ve got that covered, too! Whether for a quick dip, an afternoon of non-stop paddling (and the occasional cannonball), or just lounging with a book pool-side, our pool is ready and waiting! Not every activity revolves around water at Sterling Ridge Resort. For landlubbers and animal-lovers craving a fun-in-the-sun activity, might we suggest horseback riding? Horseback riding in the Green Mountain foothills is another memorable way to take in the breathtaking scenery of the meadows, woods, and mountains. Lajoie Stables in Jeffersonville is a family owned business offering guided tours for all riding levels. Giddy up! Summer comes and goes so quickly! Join us at Sterling Ridge to make this summer your most memorable ever.